PULLMAN, Wash. – Michael Wolcott, Washington State University Regents Professor of Civil and Environmental Engineering, has been named to the Biomass Research and Development Technical Advisory Committee, which advises both the U.S. Department of Agriculture and the U.S. Department of Energy. Comprised of representatives primarily from academia and industry, the 30-member committee is charged with advising both the U.S Secretary of Energy and the U.S. Secretary of Agriculture on issues related to advancing bioenergy technologies. A WSU Regents Professor, director of the university’s Institute for Sustainable Design, and acting director of the WSU Composite Materials & Engineering Center, Wolcott was appointed to a three-year term on the advisory panel. Wolcott holds five patents for innovative materials and structures from wood and natural fibers. He has been actively engaged with industry to commercialize his research and has participated in projects for more than 50 companies. He serves as co-project director for the Northwest Advanced Renewables Alliance (NARA) project, which aims to develop a supply chain for aviation biofuels. He was recently named Director of ASCENT, the FAA Center of Excellence for Alternative Jet Fuels and the Environment co-led by Washington State University and the Massachusetts Institute of Technology. 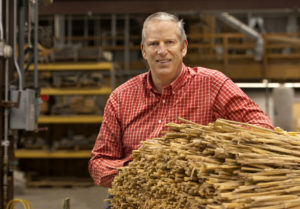 Wolcott has received numerous national awards for research excellence, and is a Fellow of the International Academy of Wood Science. He has been an invited keynote lecturer at renowned international conferences. He has previously managed over $60 million in funding and large research teams for numerous federal agencies.. He received a Ph.D. in materials engineering science from Virginia Polytechnic Institute and State University and his B.S. and M.S. in forestry from the University of Maine. Robert Strenge, WSU News, 509-335-3583, rstrenge@wsu.edu.